Become a Vet Tech > Becoming A Vet Assistant > Vet Assistant vs. Vet Tech: What’s The Difference? Vet Assistant vs. Vet Tech: What’s The Difference? Are you curious about the difference between vet assistants and vet techs? These job titles may not sound very different, but they are! Certified veterinary technicians are individuals who have graduated from a two-year vet tech program accredited by the AVMA. In most states, graduates have also taken and passed a state board examination. Almost all states require veterinary technicians or technologists to pass this credentialing exam in order to obtain official licensure or certification. Techs who have passed the state exam have entry level knowledge of the common duties and responsibilities that they will eventually perform in vet clinics or veterinary hospitals. Vet assistants, on the other hand, have not obtained their Associate’s degree. Some have gone through academic and clinical training through a high school or college certificate program, but a majority are trained on the job by the veterinarian they work for. Some have obtained degrees or certificates from online vet assistant programs. 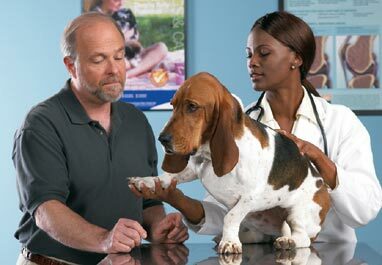 The duties and responsibilities of vet assistants are less involved compared to those of a fully credentialed vet tech. A vet assistant helps with basic tasks like patient restraint, cleaning equipment and kennels, and office work. Most vet assistants are not involved with more complex procedures like lab sample analysis, radiography, or anesthesia. These duties are typically reserved for vet techs who have undergone more extensive clinical and academic training. Other tasks commonly performed by veterinary techs instead of assistants are surgical assistance, collecting and preparing lab samples, diagnostic imagery, administing medication, and more. Because vet assistants are limited in the amount they can do, they are limited in the amount they can earn. Vet assistants may earn $9-12/hr on average, while a credentialed veterinary technician may earn $12-15/hr or more depending on years of experience. There is not much room for advancement or promotion as a vet assistant, unless your employer is willing to offer more training and provide you with more responsibility. Vet Tech vs. Vet Assistant: Which Is Right For You? Ultimately, the right job for you depends on your plans for the future. If you want to earn a living and pay the bills working in veterinary medicine, becoming a vet tech seems to be the more lucrative and secure option. Demand for vet techs is constantly on the rise, and there is generally some room for advancement and pay raises. Vet assistants, on the other hand, are limited in the amount of value they can provide for their employers. If you are just looking for part-time work or some extra income, or if you don’t want to take on all of the responsibilities of a veterinary tech, assistant could be a great fit for you. Keep in mind you do not need to be an assistant in order to become a vet tech, but it is nice to have on your resume if you are applying to a vet tech school. This entry was posted in Becoming A Vet Assistant and tagged Vet Assistant, Vet Tech, Vet Tech Career, Vet Tech School, Veterinary Assistant on June 4, 2010 by admin1.